Do you suffer from plantar fasciitis? You do, we know how difficult it is for you to enjoy an evening out, or go for an important interview. Finding the perfect footwear to wear is not easy if you have continuous pain caused by the foot problem. We know that you are struggling to find the correct shoe that will not cause you any discomfort as wearing the wrong shoes leaves your feet aching. Here you can find a guide to help you pick the best dress shoe for plantar fasciitis problems. So go ahead, read all about these shoes, and find a suitable pair on the top 10 dress shoes for plantar fasciitis list right here. For comfort and pain relief caused by plantar fasciitis consider any of the pairs of dress shoes on the list here. The LUMA dress pump is a practical shoe for any woman to wear. The footwear has a low heel with stylish design to eliminate pain the pain of plantar fasciitis. To absorb impact, it has a rubber outsole with upper leather structure. The footwear is hand-sewn and flexible, and the metal shank heel offers fantastic support. The front of the dress pump has a supporting strap and helps prevent repetitive movement commonly found with plantar fasciitis. If you have problematic feet, the LUMA offers you a dress shoe for plantar fasciitis ailments. The footwear is stylish and made durable to wear with any clothing piece from pants, skirt to a dress. Are you a man with sensitive feet and in need of a pair of dress shoes for plantar fasciitis? The Wing Classic shoe from Dr. Comfort offers you all day comfort. The upper has a hand-polished and hand-burnished leather structure. On the seams, you can see traditional brogue accent and lace up with blind eyelets. The footwear has a padded collar and tongue and offers extra support. You can buy them in two stylish colors black and chestnut and helps promote foot health. To help reduce foot pain the classic dress shoe is perfect to wear all day. The fantastic thing is the insole is removable, and you can replace it with an orthotic one. The important thing is to buy a ½ size bigger to prevent it from hurting your heels. The platform sandal is a flirty dress shoe and suitable to wear during the summer. The upper leather looks stylish and has a strappy construction with slingback heel. The toe strap you can adjust to keep the shoe secure in the front. The footwear has a slight platform to the outsole. Between the toe and heel, is a thick portion for added support. Underneath the shoe, you have a wooden sole and rubber outsole. The footbeds molded for proper alignment and comfort. Once you remove the SANITA sandal from the box, you know they are perfect to wear all day. The shoe has a stylish design and is versatile to wear with pants, skirt, or dress. The most important thing is you can stand with them all day without feeling uncomfortable on the feet. With the Cotrell Walk dress shoe for plantar fasciitis, you can feel comfortable all day. The leather shoe is suitable to wear with any dress wear. The upper has a full-grain leather structure with the lace-up closure system. To keep the toes comfortable it has a bike toe. On the sides of the vamp are two discreet gore panels for ease of wearing. The collars padded and have detail stitching with the brand logo on the side of the shoe. You can buy it in three colors dark tan, brown, and black. The Clarks dress shoe has an attractive design and fits well with lightweight construction. While the leather scuffs easily, the Oxford provides you enough support and comfort to wear all day. For a feminine dress shoe to wear with daywear, the Bindi flat shoe is perfect. The upper has a Nubuck construction and has a fantastic design to keep your feet fresh. The slip-on style makes it easy to put on and take off, and the high back construction keeps them comfortable on the feet. The rubber outsole is lightweight and offers excellent traction while the heels cupped to hold you steady when walking. In the midsection, there is a raised arch to keep the foot aligned. The Bindi Flat shoe is ideal to wear during the warm weather and looks great with formal to casual wear. The shoe feels great and is comfortable on the feet. 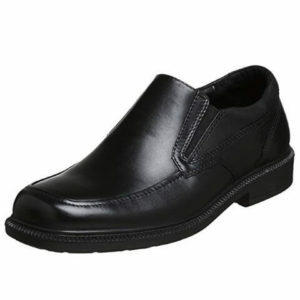 The Oxford style shoe is one of the best men’s dress shoes for plantar fasciitis. The footwear looks classy and has a professional design for any business setting. The full grain leather upper with the lace-up design is perfect to wear all day. The padded tongue and collar offers comfort and prevents chafing. The vented socks breathable and provides added cushioning. The heel platform measures 1.25-inches and produces a natural gait. You can buy it in black or brown. The shoe has a durable construction, and the gel cushioning offers a comfortable fit. The only problem you may have is that the shoe sizes are a bit off and runs on the broader side. The ORTHOFEET is a great looking dress shoe and perfect for casual to professional wear. The footwear has a one-inch heel with an elegant low-wedge design. The pump has straps on both sides with a wide opening for putting on and taking off. The soft leather upper has metal clasps with a padded collar and stretchable if your feet happen to swell. You can buy it in black leather or crock leather with different sizes. With the premium orthotic insole and anatomical arch support, you can enjoy comfort all day on your feet. The stride outsole offers you excellent traction and comfortable cushioning with the Ortho Cushion system. For an all-weather dress shoe for plantar fasciitis, these Hush Puppies are perfect. 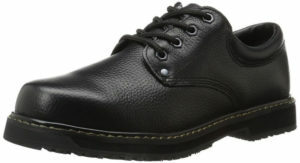 The footwear has a professional and stylish appearance with the leather upper. The slip-on shoe has two gores on the side for ease of putting on and taking off. The collars padded for comfort and the instep offers enough cushioning. You can buy the shoes in a classic black and brown. The Hush Puppies is a great shoe with a lightweight design and comfortable to wear. The leathers durable constructions perfect for wide feet. The Posie dress shoe gives you a feminine touch with a low heel. The dress shoe has a stylish leather upper with braided leather detailing in the front. You can buy the Posie dress shoe with different leather types and colors. The outsole comprises of flexible and durable construction and lined with synthetic material on footbed. The Pillow Top cushioning offers you comfort and the insole contours to your feet. For a comfortable dress shoe for plantar fasciitis relief, the pump is perfect to wear all day. The snug fit and stylish design make it versatile to wear with any clothing. Give your feet a smart look with the Graham Oxford dress shoe. The upper comprises of full grain leather and has a slip-on style with adjustable strap and buckle. The collar does not have any padding, and you can buy it in black or chocolate. The shoes specially made for diabetics as the outsole has a sponge rubber structure. The dress shoe for plantar fasciitis is perfect for wearing all day and has a lightweight design with breathable construction. The inside of the footwear has a leather lining to keep moisture from the feet. Choosing the correct footwear for your plantar fasciitis problem is not a cure but a preventative measure to keep your feet comfortable. The important thing is you are investing in a pair of good shoes offering you the necessary protection when needed the most. However, wearing a specially made plantar fasciitis shoe can help contribute to the therapy as it takes much pressure off the foot. Further, it provides enough cushioning and support in the arch, heel, and foot. So what are the features you need to look at when choosing an orthopedic shoe? Let us find out! You need the best arch support to reduce the strain but also consider a shoe with added support at the same time. Too much or little foot support can worsen the problem. Another beneficial feature is the cushioning to provide comfort and support when standing on your feet for a long time. Furthermore, the footwear needs to provide you with improved stability. Here you can look at broader heel counters as it helps prevent pronation and makes sure you do not walk incorrectly. Look for a shoe made with an EVA midsole, heel, or insole. Additionally, the footbed you must be able to remove as you can replace it with a customized one to fit with the contour of your foot. Another common fabric you can look out for is polyurethane. The material offers a shock-absorbing comfort and is more hardwearing. You typically find it in the outsole or as an insole or heel. When wearing the correct dress shoe, it can help control and prevent plantar fasciitis. Further, it can help decrease stress in the joints and helps alleviate pain found in the arch, lower back, heel, and knees. Always consider a shoe with strong heel support and good arch support. Furthermore, make sure it provides a soft cushioning, and the shoes are durable to last a while. The most important thing when selecting a dress shoe for plantar fasciitis is to keep your feet pain free. The shoe needs to be comfortable and offer you a perfect fit. All the shoes on the list will help control symptoms associated with different foot ailments to help eliminate them over time. The most significant benefit is that they are lightweight and offer you improved traction with comfortable footbeds. Further, they help to keep the feet aligned and the fabric used is kinder on your skin. The dress shoes will help reduce the stress you feel in the feet when walking and will relieve pain and lessen swelling caused by different strains. We hope you find the best dress shoe for plantar fasciitis to keep your feet ache free here. However, if you need more than a casual to formal shoe check out our other plantar fasciitis shoe reviews as well.